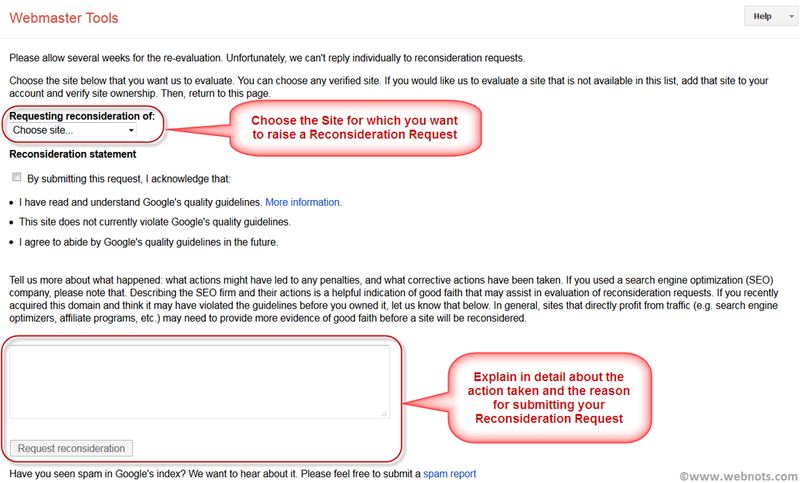 Home » Website Building » SEO » What is Google Reconsideration Request and How to Raise it? Reconsideration request is a tool for webmasters to request Google to reconsider the possibility of including your site in the Google search result again. Google will mark your site as webspam when it notices spam activities like unnatural inbound links generated for the purpose of improving search engine ranking. As a penalty, Google will set a manual spam tag on your site and remove your site from the search results or reduce the importance of showing it in the searches based on the severity of the spam. Hence, webmasters should ensure that they follow the appropriate guidelines before raising the request and do some simple testing yourself before raising a request. Webmasters start building unnatural links. Google penalizes the site for unnatural links and tags the site with “Manual Spam” indicator. 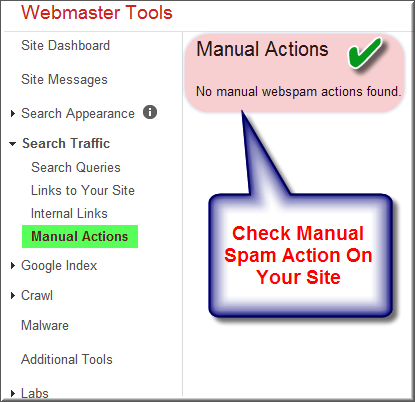 Webmasters can check the status of “Manual Spam” in Google Webmaster Tools account. Webmasters need to take corrective actions to demote all unnecessary links. Webmasters submit reconsideration request to Google. Google decides whether to list the site back in search results or not. When to Raise a Reconsideration Request? Though more number of people visit site B, Google will show site A top in the search results for the same search query both sites are competing. This algorithm made most webmasters and SEO companies actively started working on building external links. Google was forced to stop this unnatural link building activities to ensure the purpose of external linking makes sense in the search algorithm so introduced a concept called “Manual Spam”. Once Google think a site has lot of unnatural links then it will mark that site with “Manual Spam” tag and delist or demote the site from search results. Check your webmaster tools account that Google sent you a notification regarding any issues about manual spam on your site. The notifications can be seen in “Messages” section. If there is a message, understand the issue and work on the corrective action before raising the request. With the recent changes in Webmaster Tools interface, Google introduced a new feature for checking manual spam action within your account. Login to your account and navigate to “Manual Actions” option available under “Search Traffic” menu. You can see the manual action taken by Google quality team in this section as shown in the below picture. Most of the webspam messages are related to spammy inbound links pointing to your site. Since these inbound links are a major factor for search engine ranking, Google treats this spam links severely and mark your site as manual webspam. When you received a message on spammy links first step is to check the “Links to Your Site” section in the webmaster tools to find the links that are pointing to your site. If you find irrelevant links (whether you created it or someone created it), work as much as possible on removing or no-following those links. Search your site’s URL in Google search and if your site is found in the top few positions then you don’t need to worry much. If your site is not appearing at all or appearing after few pages then there is a high possibility that Google marked your site as a webspam. The other way is to search with exact content of your site, in order to do this copy and paste one paragraph from your site in Google search; this should show the corresponding page in your site in the top few positions. Ensure you or your SEO company did not follow any black hat SEO techniques. How to Raise a Reconsideration Request? In order to raise a reconsideration request you should have a Google webmaster tools account, added your site and verified it successfully. Login to your account and click here to raise a reconsideration request. The option for raising a request is not available inside Webmaster Tools account; hence you need to follow the above link in order to go to the request page. Following actions should be considered to bring the site back in search results. Download all external links from Google Webmaster Tools under “Search Traffic > Links to Your Site” and analyze what would have went wrong with those links. Demote all unnatural links to the site using “demote URL” tool. Contact webmasters of external sites and request them to delete the links. After ensuring the necessary corrections were down then submit a reconsideration request to Google with list of proofs for corrective actions and request for removing the “Manual Spam” and including your site back in search results. It may take several weeks for Google to respond the reconsideration request and based on the response the site may reappear again in the search results. Be truthful when raising a reconsideration request since Google already detected some malicious activities from in your site and marked it as webspam. Mention step by step actions you had taken to remove unnatural links before raising the request. Provide the name of the SEO company in case if you got help from them. Provide the ownership details in case you acquired the site recently from other site owner. After submitting your reconsideration request Google’s Search Quality team will check your site and respond back within few days to few weeks time. Google does not provide a direct link inside webmaster tools account for submitting reconsideration request, but logging into webmaster tools account is mandatory for submission. In general webmasters should not submit the request unnecessarily unless webmaster tools account indicates the “Manual Webspam” action. The general indication is that sudden drop in traffic without any major activity on the site followed by an email from Google on webspam.